[? ]Subscribe for Free Site Updates! Here's one of the few indoor pictures I will be including in my gallery pages. I think the picture looks ok, but there's something magical about the combination of butterflies and flowers. After seeing them together, you realize that's the way flowers and butterflies were meant to be. Camera: Nikon D60 with 18-55mm Zoom lens. 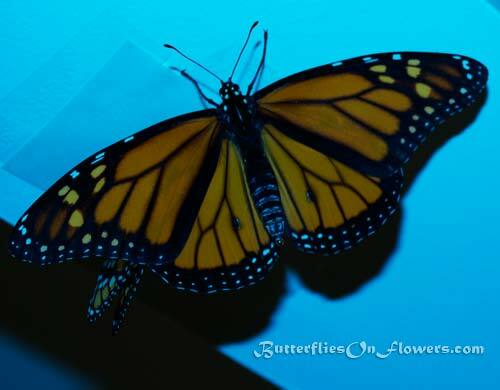 Monarch facts: Adult butterflies always hatch in the early morning hours primarily between 6:00am and 10:30am. This likely occurs so the monarchs have a chance to dry their wings in the warm sunlight. If they hatched in the evening or overnight, they would be vulnerable to predators for a longer period of time due to their wet butterfly wings. The latest I have experienced a butterfly hatching is 1:30pm. Advertising and Disclosures Copyright ©2010 ButterfliesOnFlowers.com. All Rights Reserved.